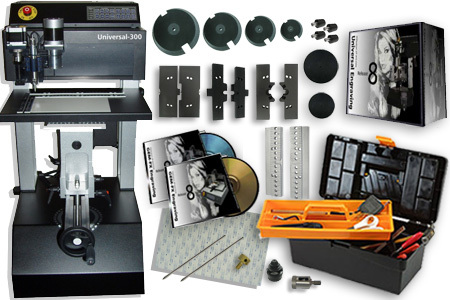 The U-Marq Universal-300 engraving machine is every engravers dream. This versatile engraving machine is both sleek and practically noiseless, making it ideal for use in any workshop or retail environment. The U-Marq Universal-300 pairs both an ample, flat engraving surface with a more than generous cylindrical work area for a combination that knows no limitations. Equip with a 100W Brushless Hall Effect DC Motor, the Universal-300 engraver can reach spindle speeds of 18,000 RPM and feed rates up to 4.5” (116mm) per second. Contrary to most engraving machines, the Universal-300 consists of an innovative “tower-like” design in which the key components are stacked vertically, eliminating restrictions that would generally compromise the ability to engrave on large or oddly shaped items. In short, whether you are engraving on your every day brass plaques or faced with a once in a blue moon samurai sword, you will find time and time again that the U-Marq Universal-300 is an engraving machine truly worthy of its name. The U-Marq Universal-300 supports a wide variety of materials. Aluminum, brass, steel, plastic, acrylic, wood, plaster, glass and resin are just a few of the materials the U-Marq Universal-300 is capable of engraving. 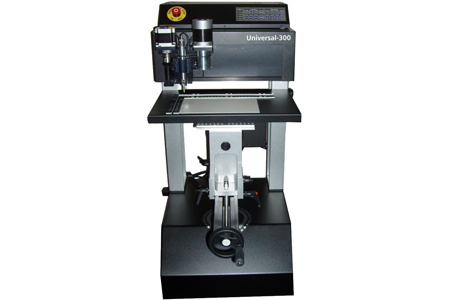 In addition, the Universal-300 can perform cut-outs; a commonly used function for creating various shapes, equipment legend panels and nameplates. The removable flat engraving table is ideal for performing such cut-outs and for engraving everything from signage and identification tags to trophy plaques and awards. For jewelry and gift engraving, the adjustable center vise provides an abundance of versatility. With the use of the various jigs, the center vise can accommodate pens, rings, watches, medallions, lighters, dog tags and even cufflinks. To top it off, the cylindrical attachments allows you to take rings and bangle bracelets to the next level by engraving 360° around the inside and outside of their circumferences. While most 4-axis engravers stop there, the U-Marq Universal-300’s clever design allows for cylindrical engraving on a multitude of larger objects. Cups, mugs, tankards, trophies, bottles and bowls can all benefit from the Universal-300’s cylindrical engraving capabilities. The Universal-300 comes equip with a 9.4” x 5.2” (240mm x 132mm) removable engraving table. This handy feature facilitates the engraving of nametags, identification tags, labels, awards, plaques, trophy plates, signage and much more. Having a flat engraving table is also a key element for producing cut-outs. Contrary to the traditional way of casting jewelry, with the available precious metal cutting kit, the U-Marq Universal-300 engraving machine allows you to create gold, silver and platinum nameplates with ease and in a fraction of the time. An optional swarf extractor will ensure that all the excess precious metal particles will be collected and not wasted. In addition, the cut-out feature is often used for creating equipment legend panels and electrical receptacles. Whether you’re engraving individual items or thousands alike, the U-Marq Universal-300 engraver ensures that every job is a simple job. A very accommodating feature on every U-Marq engraver machine is the ability to affix any type of object in place with its center vise and array of jigs. Jewelry, pendants, dog tags, Zippo lighters, rings, pens, watches and medallions are but a few of the immeasurable amount of items the Universal-300 is capable of engraving on. With the included standard jig and jig pins, you can rest assured that the majority of the items you encounter will be easily secured. For jewelers, the ring/pen jig, watch/medallion jig and jewelry jig are also included with the machine. In addition, the center vise occasionally picks up where the flat engraving table leaves off. 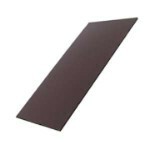 Large flat items; such as serving trays that exceed the engraving table’s dimensions, can be held in place with the use of the center vise, which can open to an impressive 16.5” (420mm) in length and can also be raised, lowered, tilted and rotated. No matter what type of business you are in, you will most certainly appreciate the facilitating qualities of the Universal-300’s center vise. 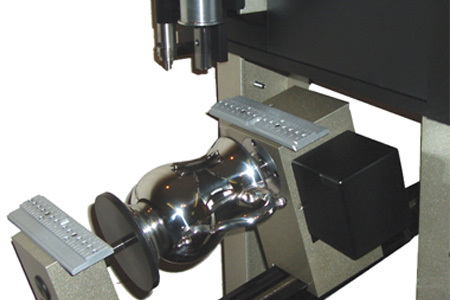 Imagine the possibilities of possessing a true 4-Axis engraving machine. While most engravers allow you to engrave left to right (X), front to back (Y) and up and down (Z), the U-Marq Universal-300 offers yet another axis. This 4th axis is essential for what is known as ‘cylindrical engraving’. With the use of the cup cones and face plates, various items from cups and mugs to tankards and trophies can be rotated and engraved 360° around their surfaces. The faceplate is used to support the base of the item while the cup cone is inserted into the opening of the cup, mug or trophy, securing the item firmly into place. The U-Marq Universal-300 engraver comes equip with two (50mm, 100mm) face plates and four (15mm, 50mm, 85mm, 125mm) cup cones. As if that wasn’t enough; with the addition of the glass engraving kit, you can also engrave on bowls, champagne flutes, wine glasses and wine bottles. In addition, the cylindrical axis can be raised, lowered, rotated or angled to accommodate conical items and objects of unusual shapes or sizes. 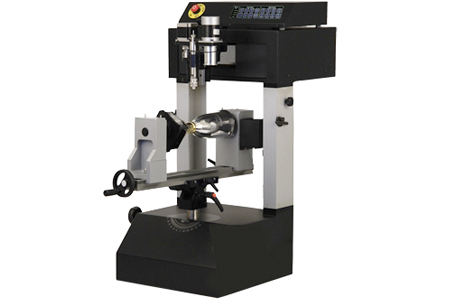 Furthermore, the Universal-300 engraving machine can accommodate cylindrical items up to 10.5” (265mm) in diameter and 16.5” (420mm) in length. This alone is perhaps the main reason most people choose the U-Marq Universal-300 over the competition. The 4th Axis provides yet another advantage to owning the Universal-300 engraver. With the addition of the ring attachment, the U-Marq Universal-300 can engrave 360° around the inside and outside of rings measuring up to 1.1” (28mm) in diameter. Throw in the optional bangle attachment and increase the engraving diameter up to 2.95” (75mm). You can now engrave the inside and outside of bangle bracelets and rings with the same efficiency and ease as if you were engraving on flat items.